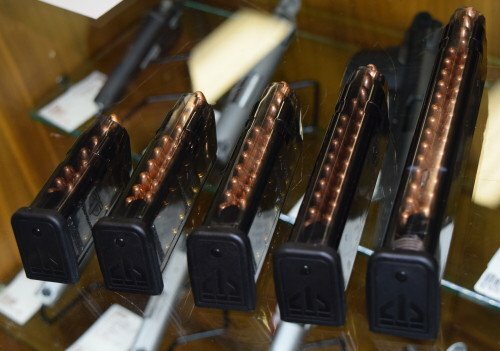 The ETS Glock 9mm magazine options, shown at the Faxon Firearms event. From L to R: 10, 15, 17, 22, and 31-round 9mm capacities. On Thursday, January 22, during the 2016 SHOT Show, the BlueSheepDog Crew were some of a small, hand-picked group of journalists and dealers invited to attend the 2nd Annual Burgers and Bullets event hosted by Faxon Firearms. During this event at Range 702 in Las Vegas, NV, we had the opportunity to test fire several Elite Tactical Systems (ETS) Glock magazines. BlueSheepDog had previously reported on the new click here). From the information in the press release the ETS magazines looked like a really good alternative to the more expensive Glock factory magazines. After testing them during SHOT Show, we can confirm they are great magazines. Thankfully the smaller shooting event hosted at Range 702 allowed shooters more time, and more ammo, to test out the products on display. 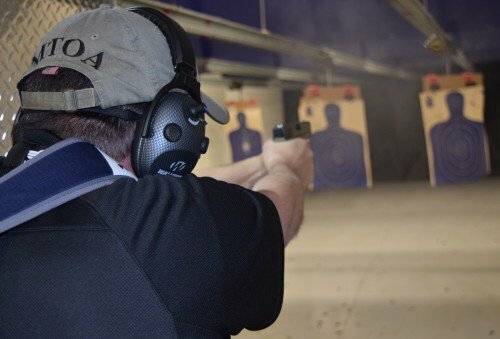 The Industry Day at the Range is a wonderful event, but with larger crowds, the ability to spend quality time with a firearm or accessory tends to be limited. Elite Tactical Systems was not stingy at all during the Faxon Firearms event. Each magazine was fully loaded, instead of shorter round counts often encountered at Industry Day at the Range. The ETS magazines felt very sturdy in my hands, and the construction appeared to be top-notch. 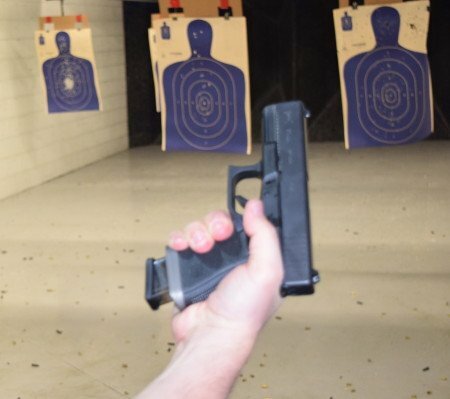 ETS magazines had an excellent fit in the Glock pistols. ETS Glock magazines had no problems seating in the various Glock pistols we shot with. The magazine seating was solid and there was no movement from the magazine once it was fully inserted into place. 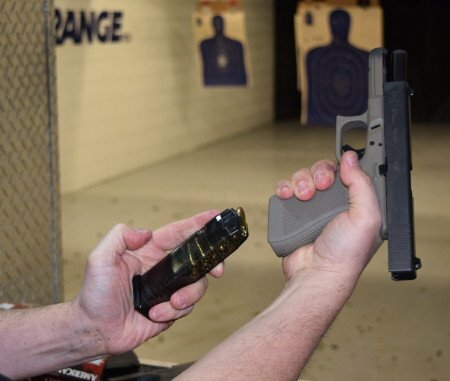 While shooting the various sized ETS magazines from full size, compact, and sub-compact Glocks we suffered no failure-to-fire (FTF) or failure-to-eject (FTE). 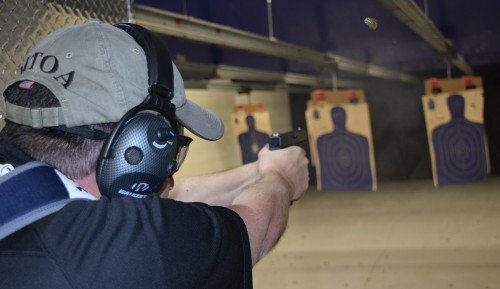 The shooting experience was great, and we had no feeding problems whatsoever. A 15-round ETS magazine seats just fine in the compact Glock 19. Firing the ETS magazines to empty resulted in the expected slide lock back each time, except for one time where I noted my strong hand thumb was resting on the slide lock lever. My grip had kept the slide lock lever from raising into position to lock the slide. This was shooter error, and had nothing to do with the ETS magazine design or function. When releasing the mag, the ETS magazines released easily and unencumbered. 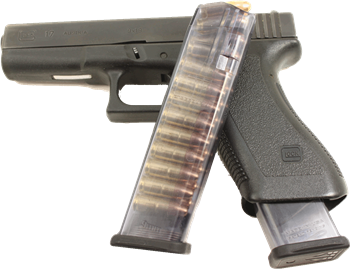 Unlike standard Glock magazines that can sometimes get caught up in the magazine well, requiring stripping, the ETS magazines fell free each time unassisted. In fact, the shooter better have their off-hand ready to catch the ETS magazine when the magazine release lever is pressed. Otherwise you can expect to pick the ETS magazine up off of the floor, they come out that smooth and reliably. We did not drop any magazines, but we witnessed a few other not as cautious shooters experience the drop. As advertised, the magazines sustained the drop onto concrete with no problems to functionality. In fact, I later examined the ETS magazines that had fallen and did not even see any scuff marks from the hit. ETS magazines performed flawlessly. Again the ejected casing in the upper right, and the Glock is already back in battery. Although our experiences with ETS magazines was somewhat limited, we did get to shoot sub-compact, compact, full size and extended magazines. Each performed flawlessly. Between the two shooters we sent, we probably shot between 100-150 rounds through various Glock handguns and various ETS magazines. EDITOR’S NOTE: For a more detailed description of the ETS Glock magazines check our our previous article on the press release issued in September, 2015. Elite Tactical Systems magazines are made from advanced polymers designed to provide extreme impact resistance. 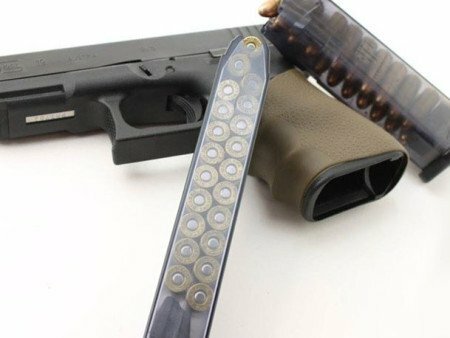 The benefit of the ETS translucent body is the ability to make quick load checks under pressure, without having to try to see a small dot on the back of standard Glock magazines. The ETS Glock magazines are chemically designed to resist becoming brittle over time, and are also resistant to harsh environments, chemicals, or extreme cold. Translucent magazines make load identification easy. The polymers are designed to be strong enough to avoid “creep” over time, avoiding the expansion over time some polymers begin to experience under pressure. This feature allows ETS magazines to be stored fully loaded with no danger that the feed lips or body will become compromised. ETS magazines have an ergonomically designed floor plate for what ETS claims to be an easier draw from magazine pouches. The floor plates are more easily removed than standard Glock magazine floor plates, and can be exchanged for the shooter’s choice of Glock magazine floor plate options. Larger or extended round ETS magazines perform just fine in compact or sub-compact Glock pistols. As with standard Glock magazines, the larger ETS Glock magazines will fit into the compact and sub-compact Glock pistols without issue. 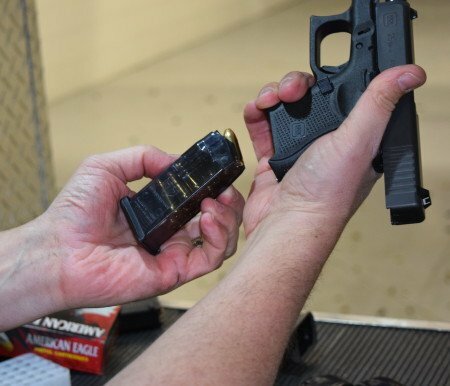 The ability to use full size (or larger) duty magazines in an officer’s back-up firearm is a critical component in back-up or off-duty firearm selection. BlueSheepDog recommends officers select a back-up pistol in the line of their duty firearm. Choosing a back-pistol in the same line as their duty firearm allows immediate function recognition for an officer that has had to resort to their back-up. Typically this doesn’t happen unless the situation is critical, and trying to remember a different system at that time is setting the officer up for failure. By using a smaller pistol in the same line as your duty firearm, that allows the use of duty magazines adds to the firepower the officer has on hand. An extended ETS magazine in a full-size Glock. The extended ETS Glock magazines could be used in 9mm or .40 S&W carbines that are making a big surge on the market. Many of the carbine options we saw at SHOT Show were centered around Glock magazines. Glock still has a dominant share of American law enforcement handguns, so tailoring a carbine around their magazines makes perfect sense. The surge in Glock-compatible carbines makes ETS extended Glock magazines even more beneficial. The amazing 31-round 9mm magazine and 22-round .40 S&W magazine provide sufficient firepower for a carbine. As mentioned in our previous article on ETS magazines, these extended magazines could be a great resource to shield operators or other officers tasked with critical gear. Those officers typically cannot field a long gun, and have to rely on their pistols instead. Having an extended magazine provides greater confidence of remaining in the fight for those officers. Creep resistant—feed lips and body won’t spread during long-term, fully loaded storage. We had no problems shooting the ETS Glock magazines. Note the ejected brass in the upper right, and the Glock is already back in battery. Though our testing at the Faxon Firearms event would not be considered a “thorough” review of ETS magazines, from our experiences with the ETS magazines I have no problem recommending them for duty or off-duty use. ETS magazines are roughly 25-30% cheaper than standard Glock magazines, and have shown themselves to be well made alternatives. The translucent polymer makes checking round counts much easier than standard Glock magazines, and the smoother polymer material allows ETS magazines to confidently fall free when released. This feature alone could improve reload times for both Tactical or Combat reloads, improving officer survivability. 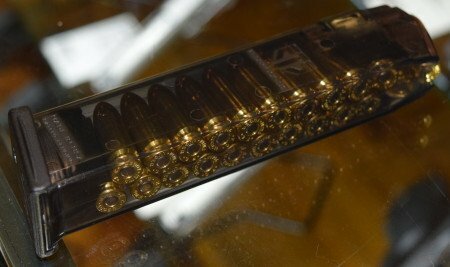 “This feature alone could increase reload times for both Tactical or Combat reloads, improving officer survivability. I believe you guys meant decrease reload times. Not being a grammar stickler I just notice these little things when reading blogs. Thank you, great informative review.